All Products > "5500032 Seagull Decathlon (120)"
Were designed to sweep away the cares and stresses of 21st century life. They are easy to fly with big, airy, spacious fuselages, super-lasered and laminated components with wonderful glass cloth cowls and spats painted with Rembrandt-like care and accuracy! 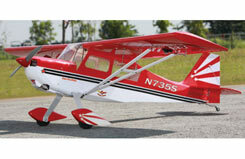 They suit the intermediate level sport flyer and can be seen as the next stage on from the easy flying Seagull trainers. Cubs and Decathlons are all easy to fly and quick to assemble thanks to the usual finished, covered and decorated components. You can probably see they are all factory-built to a very high standard with precision laser-cutting and high quality Oracover film as standard. As usual, the pushrods, the motor mounts, hinges, etc are factory-fitted for the fastest assembly time.